Evelyn is a classically trained jeweller and goldsmith skilled in the centuries old tradition of lamp fired Bohemian glass bead making. 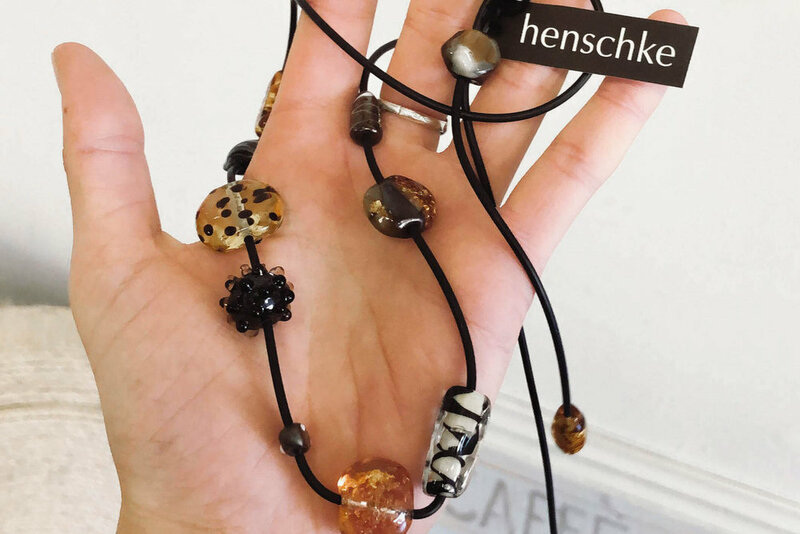 The story of Henschke Jewellery mirrors the history of traditional Bohemian glass. All great traditions breathe and evolve. Faced with adversity, they pack up and move. They put down new roots in faraway places and sooner or later they begin to thrive and to reflect and celebrate their strange new homes. Transplanted from Germany to Broome in Australia’s remote northwest, Evelyn found work with Linneys, internationally renowned creators of exquisite South Sea Pearl jewellery. In cahoots with Linneys’ team and several of their adventurous clients, Evelyn discovered that lustrous South Sea Pearls were the perfect complement to her beads. Evelyn now makes one of a kind, unique glass jewellery made with my handmade beads, strung onto industrial grade neoprene cord.